Lorena Mai Anderson, Age 92, of Pegram, Tennessee, passed away peacefully at home on December 8, 2018. She was preceded in death by her devoted husband, Grover Cleveland Anderson. She is survived by her loving son, Don (Lynne) Anderson; grandson, Nathan (Becca) Anderson; granddaughter, Lauren (Zach) Jackson; great-grandchildren, Haddi, Hayes and Yates; sisters, Carolyn Miller, Betty Donegan, Bell (Charles) Sanders; brother, Ross (Zoe) Greer; foster daughter, Eulene Tanner; and many nieces and nephews. Throughout her life, she shared her many interests and talents with family and friends. She had a love for flowers, enjoyed cooking and was an avid baker. She looked forward to her morning coffee, working the crossword puzzle, and watching college basketball. 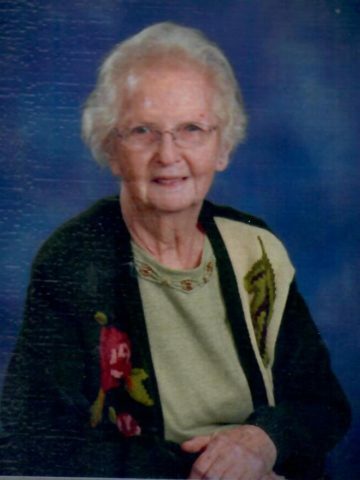 She was also a life-long member of the Pegram United Methodist Church. Her feisty, sweet spirit will be greatly missed. The family would like to express their deep gratitude to Mom’s caregiver, Maggie Alderson, for ever present love, attention and dedication. Also, to Willowbrook Hospice and their staff and volunteers who were there at the end of her journey. Family and friends are invited to share memories during visitation from 3- 8 p.m. on Tuesday, December 11, 2018 at Harpeth Hills Funeral Home. A Celebration of Life Service will be at 10 a.m. on Wednesday, December 12, 2018 at Harpeth Hills Funeral Home. Interment will follow at Harpeth Hills Memory Gardens. In lieu of flowers, the family requests that donations be made to the Pegram United Methodist Church, Willowbrook, or other charity. She was so special. Don, my thoughts and prayers are with you and your family. Aunt Lorena was a very favorite aunt of mine! So sweet and so warm and loving. Summers staying with Uncle Grover and Aunt Lorena were so special. Don was just a baby and Eulene and I took care of him while Aunt Lorena worked downtown. Sundays going to the Pegram Methodist Church, and New Year’s Eve parties playing Rook, and the summer barbeques are all part of my memories of Uncle Grover and Aunt Lorena. I miss you both! My love and sympathies to Eulene, Don and Lynne. My prayers are with you in the loss of your Mom. May God bless and strengthen you during this difficult time.